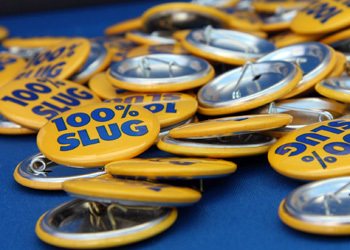 Of the more than 4,100 prospective freshmen who announced their intention to enroll, approximately 3,500 are expected to become 100 percent banana slugs next fall. As of May 1, UCSC had received 4,119 Statements of Intent to Register (SIRs) from prospective freshmen. The final number of new students who decide to enroll will not be known until September. UCSC had placed more than 1,100 freshmen on a waitlist, but given the number of SIRs received, the campus was unable to admit any waitlisted students. "We continue to attract highly qualified students to UC Santa Cruz," Chancellor George Blumenthal said. "Their interest is a reflection of the talented people and renowned programs at our campus." Blumenthal said he was particularly pleased by the sharp increase in interest among underrepresented students. The vast majority of new freshmen are California residents (97.9 percent), up 378 from a year earlier, and the campus also had a small increase in students coming from outside of California. UCSC's anticipates 3,500 freshmen will enroll in fall. The number of SIRs submitted by May 1 is always higher than the eventual fall enrollment for a variety of reasons, Whittingham said, including but not limited to students making a final decision to attend elsewhere, family situations, and final academic outcomes. Whittingham said many attributes of the incoming class stand out: The students' academic profile remains strong, both in average GPA and test scores. UCSC also continued to attract a high percentage of students from underrepresented ethnic groups, from students coming from low socioeconomic backgrounds, and from students who will be the first in their family to earn a four-year degree. "The University of California is defined by the quality of its academic programs and by the access to that quality," Whittingham said, "so we are extremely pleased by the academic achievement and diversity of UCSC's incoming freshman class." The average GPA for the incoming freshmen is 3.59. The average SAT-reasoning scores were also strong: 1,696 composite, 559 critical reading, 561 writing, and 576 mathematics. The percentage of underrepresented students among the incoming freshman class increased to 34.9 percent, up from last year's 29.9 percent. Of the incoming frosh, 29.7 percent are Chicano/Latino, and 28.3 percent are Asian American or Pacific Islander. UC Santa Cruz experienced the highest increase of UC campuses in the number of California African Americans intending to enroll and the second highest increase in the number of California Chicano/Latino students intending to enroll. Whittingham said she shares deep appreciation for the Student Initiated Outreach programs at UCSC that aim to increase the number of underrepresented students who enroll and graduate from UC Santa Cruz. During recent graduation ceremonies held on campus, there was a consistent theme of graduates who had first visited campus on these programs. Their success continues to build excitement and a strong sense of community for students. "We are especially excited that 44 percent of our incoming freshman class will be the first in their families to earn a four-year college degree, and that 28 percent of the freshmen come from low-income backgrounds (from families earning less than $40,000)," Whittingham added. "All of these numbers underscore our ability to create access and opportunities for highly diverse groups of students, something that our campus takes great pride in." The UC system today also released numbers of community college students who have filed SIRs with UC's nine general campuses. At UCSC, 1,615 transfer students from community colleges throughout California have expressed their intent to enroll this fall. UCSC's enrollment target for transfer students in the 2011-12 academic year is 1,250. "The UC system has made it a priority to expand access to transfer students from California's community colleges, so we are particularly pleased with the strong interest these students have shown in UC Santa Cruz for the coming year," Whittingham said. UCSC has been preparing all year to officially welcome and provide academic and social transition support to new students and their families beginning July 19 during orientation. The campus expects more than 6,400 students, family members, and guests to attend. For more information, see http://admissions.ucsc.edu/orientation/. Orientation for new frosh will take place from Tuesday, July 19 through Tuesday, July 26 with separate sessions set each day. Orientation for new transfer students will be Friday, July 22.